Feb 2015: A lot’s happened since I wrote this post two years ago. Chrome forked WebKit and started Blink, Opera adopted Chromium, and node-webkit became nw.js. This post describes a complexity of defining WebKit that doesn’t exist much anymore; with Chrome’s departure the WebKit world is more simple and clear. WebKit is deployed through iOS Safari and Mac Safari, and the active GTK community leverages WebKit inside the GNOME Platform. Some smaller mobile browsers use WebKit, some Chromium, some use forks of either, and many just use the system WebViews that are both powered by up-to-date version of iOS WebKit and Android Chromium. The post below is kept intact and represents a snapshot of history in early 2013, rather than the modern WebKit landscape. WebKit isn’t a black box. It’s a white box. And not just that, but an open, white box. 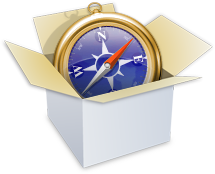 How is WebKit used by WebKit-based browsers? 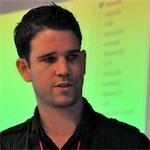 Why are all WebKits not the same? Now, especially with the news that Opera has moved to WebKit, we have a lot of WebKit browsers out there, but its pretty hard to know what they share and where they part ways. Below we’ll hopefully shine some light on this. As a result you’ll be able to diagnose browser differences better, report bugs at the right tracker, and understand how to develop against specific browsers more effectively. Which of those are shared in WebKit-based browsers? Pretty much only the first two. What is the popular reference to WebKit is usually Apple’s own flavor of WebKit which runs on Mac OS X (the first and the original WebKit library). As you can guess, the various interfaces are implemented using different native libraries on Mac OS X, mostly centered around CoreFoundation. For example, if you specify a flat colored button with specific border radius, well WebKit knows where and how to draw that button. However, the final actual responsibility of drawing the button (as pixels on the user’s monitor) falls into CoreGraphics. As mentioned above, using CG is unique to the Mac port. Chrome on Mac uses Skia here. 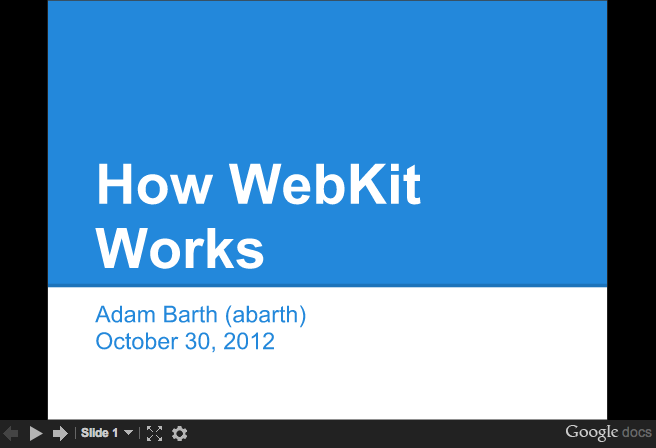 With time, WebKit was “ported” into different platform, both desktop and mobile. Such flavor is often called “a WebKit port”. For Safari Windows, Apple themselves also ported WebKit to run on Windows, using the Windows version of its (limited implementation of) CoreFoundation library. … though Safari for Windows is now dead. Beside that, there were many other “ports” as well (see the full list). Google has created and continues to maintain its Chromium port. There is also WebKitGtk which is based on Gtk+. Nokia (through Trolltech, which it acquired) maintains the Qt port of WebKit, popular as its QtWebKit module. Chromium also powers Yandex Browser, 360 Browser, Sogou Browser, and soon, Opera. Different ports can have different focuses. The Mac port’s focus is split between Browser and OS, and introduces Obj-C and C++ bindings to embed the renderer into native applications. Chromium’s focus is purely on the browser. 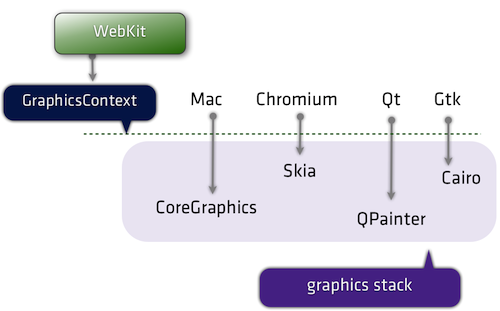 QtWebKit offers its port for applications to use as a runtime or rendering engine within its cross-platform GUI application architecture. First, let’s review the commonalities shared by all WebKit ports. You know it’s funny. I tried writing this a few times. So first, WebKit parses HTML the same way. Well, except Chromium is the only port so far to enable threaded HTML parsing support. … Okay, but once parsed, the DOM tree is constructed the same. Well, actually Shadow DOM is only turned on for the Chromium port, so DOM construction varies. Same goes for custom elements. … Okay, well WebKit creates a window object and document object for everyone. True, though the properties and constructors it exposes can be conditional on the feature flags enabled. … CSS parsing is the same, though. Slurping up your CSS and turning it into CSSOM’s pretty standard. Yeah, though Chrome accepts just the -webkit- prefix whereas Apple and other ports accept legacy prefixes like -khtml- and -apple-. … Layout.. positioning? Those are the bread and butter. Same, right? Come on! Sub-pixel layout and saturated layout arithmetic is part of WebKit but differs from port to port. Just like how Flickr and Github implement features behind flags, WebKit does the same. This allows ports to enable/disable all sorts of functionality with WebKit’s compile-time Feature Flags. Features can also be exposed as run-time flags either through command line switches (Chromium’s here) or configuration like about:flags. The UI and instrumentation for the Chrome DevTools aka WebKit Inspector. Though backends vary. Each port may use a different storage layer for localStorage and may use different audio APIs for Web Audio API. It gets a little murky in those areas. Let’s try some differences that are much less murky. Or to go a little more micro… a recently landed feature: CSS.supports() was enabled for all ports except win and wincairo, which don’t have css3 conditional features enabled. Now that we’ve gotten technical.. time to get pedantic. Even the above isn’t correct. It’s actually WebCore that’s shared. WebCore is a layout, rendering, and Document Object Model (DOM) library for HTML and SVG, and is generally what people think of when they say WebKit. In actuality “WebKit” is technically the binding layer between WebCore and the ports, though in casual conversation this distinction is mostly unimportant. 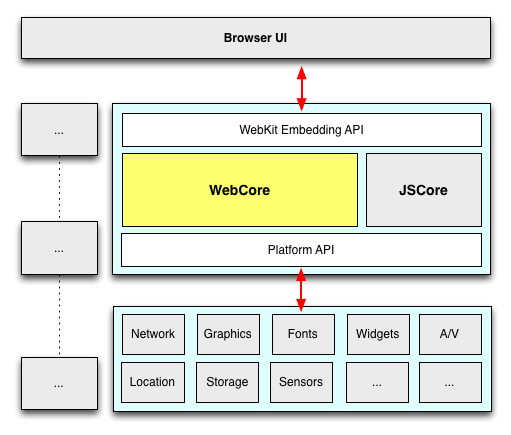 Many of the components within WebKit are swappable (shown above in gray). Fonts and Text rendering is a huge part of platform. There are 2 separate text paths in WebKit: Fast and Complex. Both require platform-specific (port-side) support, but Fast just needs to know how to blit glyphs (which WebKit caches for the platform) and complex actually hands the whole string off to the platform layer and says “draw this, plz”. Now, let’s widen the lens and look at a few ports and a few subsystems. Below are five ports of WebKit; consider how varied their stacks are, despite sharing much of WebCore. All right, so where does this leave us? So, all WebKits are totally different now. I’m scared. Don’t be! The layoutTest coverage in WebKit is enormous (28,000 layoutTests at last count), not only for existing features but for any found regressions. In fact, whenever you’re exploring some new or esoteric DOM/CSS/HTML5-y feature, the layoutTests often have fantastic minimal demos of the entire web platform. In addition, the W3C is ramping up its effort for conformance suite testing. This means we can expect both different WebKit ports and all browsers to be testing against the same suite of tests, leading to fewer quirks and a more interoperable web. For all those who have assisted this effort by going to a Test The Web Forward event… thank you! Opera just moved to WebKit. How does that play out? Robert Nyman and Rob Hawkes touched on this, too, but I’ll add that one of the significant parts of Opera’s announcement was that Opera adopted Chromium. This means the WebGL, Canvas, HTML5 forms, 2D graphics implementations–all that stuff will be the same on Chrome and Opera now. Same APIs, and same backend implementation. Since Opera is Chromium-based, you can feel confident that your cutting-edge work will be compatible with Chrome and Opera simultaneously. I should also point out that all Opera browsers will be adopting Chromium. So Opera for Windows, Mac and Linux and Opera Mobile (the fully fledged mobile browser). Even Opera Mini, the thin client, will be swapping out the current server-side rendering farm based on Presto with one based on Chromium. .. and the WebKit Nightly. What is that? It’s the mac port of WebKit, running inside of the same binary that Safari uses (though with a few underlying libraries swapped out). Apple mostly calls the shots in it, so its behavior and feature set is congruent with what you’ll find in Safari. In many cases Apple takes a conservative approach when enabling features that other ports may be implementing or experimenting with. Anyway, if you want to go back to middle-school analogies, think of it as… WebKit Nightly is to Safari what Chromium is to Chrome. Chrome Canary also has the latest WebKit source within a day or so. Tell me more about WebKit internals. Hopefully this article described a bit of the internals of WebKit browsers and gave some insight on where the WebKit ends and the ports begin. Reviewed by Peter Beverloo (Chrome), Eric Seidel (WebKit). I’ll update with any corrections or modifications. 8:30am. Removing the slides embed because it’s making Firefox scroll to its position. 10:49am. Fixed broken link and typo. (thx tim!) Fixed weird meta description choice. Nokia (through Trolltech, which it acquired) maintains the Qt port of WebKit, popular as its QtWebKit module. It might be valuable to mentioned that Digia acquired the Trolltech/Qt division of Nokia and now maintains QtWebKit. Also, not to be too nit-picker, in your subtitles “Some of the ports of WebKit” I would have said “Some of the Products running on top of specific ports of WebKit” because strictly speaking Safari is not a port, but a “Browser that makes use of the Apple WebKit port on Mac”. 5:00pm. This article has been translated into Japanese. Thanks Masataka Yakura! 2013-04-06: Chrome emeritus Ben Goodger gave more insight on the relationship between WebCore, WebKit, WebKit2 and the Chromium Content API that’s useful context.